Figures from Mexico’s central bank (Banco de México) show that the value of remittances sent home by Mexicans working in the USA fell 3.75% in 2013, compared to the previous year. Trends in remittance payments are closely linked to trends in the US economy, so the slight fall in the past two years is no great surprise, as the US economy struggles to regain growth following the 2008 financial crisis. There are some positive signs. Despite the decline over the year as a whole, the month of December saw remittances entering Mexico of 1.8 billion dollars, higher than any December since 2007. In the last quarter of 2013, remittance payments were 3.46% higher than for the same period in 2012 (mainly due to a higher number of remittance payments), suggesting that remittance payments may now be on the rise again. The average amount remitted during the last quarter of 2013 was 285.34 dollars, 3.8% less than the average for the equivalent period in 2012. Note: These remittance figures quantify only remittances sent via “formal” channels such as banks, and do not include informal payments carried directly back to Mexico by family or friends. The annual total of remittances sent back to families in Mexico by migrant workers in the USA increased year-on-year to 22.731 billion dollars in 2011, and looks set to rise again this year. Mexico’s central bank (the Bank of Mexico) recently released figures showing that remittances to Mexico increased in April 2012 by more than 8% compared to the same month a year earlier, bringing the cumulative total for the first four months of this year to 7.4 billion dollars, 6% higher than in the same period in 2011. These increases in remittance flows come despite increasing evidence that the net flow of migrants leaving Mexico to work in the USA has come to a standstill: Net migration flow from Mexico to the USA falls close to zero or has possibly reversed. 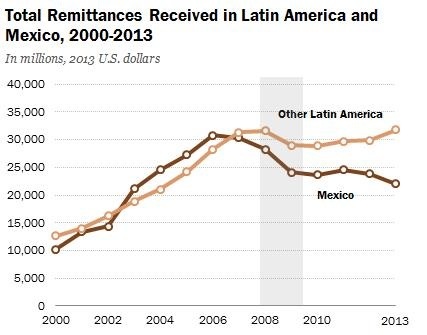 Remittances sent home by Mexican migrants, almost all of them residing in the USA, rose 6.9% in 2011 (compared to 2010) to 22.730 billion dollars. Remittances are the second largest source of foreign exchange in Mexico after crude oil exports. The average amount sent was 326.26 dollars, with 98% of remittances made via electronic transfer. The states receiving most remittances were Michoacán (2.238 billion dollars, 10% of the total), Guanajuato (2.147 billion), Jalisco (1.889 billion), the State of Mexico (1.653 billion) and Puebla (1.465 billion). Looking for a practical exercise about migration and remittance flows to challenge your students? Remittances (the funds sent by migrant workers back to their families) are a major international financial flow into Mexico. Remittances bring more than 20 billion dollars a year into the economy, an amount equivalent to 2.5% of Mexico’s GDP. On a per person basis, Mexico receives more worker remittances than any other major country in the world. An estimated 20% of Mexican residents regularly receive some financial support from relatives working abroad. Such remittances are the mainstay of the economies of many Mexican families, especially in rural areas of Durango, Zacatecas, Guanajuato, Jalisco and Michoacán. 1. Which US areas have most Mexican migrants? 2. Which US areas send the highest value of remittances back to Mexico? Use column 4 of Table VI.A.1 to show the value of total “annual remittance flows” on a base map. You may be able to superimpose this information on the same base map you drew for Q1 which would make it very easy to see if the areas with most Mexican nationals send the most remittances back to Mexico each year. Can you see any anomalies on your map, either where an area sends far more remittances back than might be expected from the number of migrants, or where an area sends only a small value of remittances back despite having a very large number of Mexican nationals? 3. How does the “average remittance” (column 5 of Table VI.A.1 vary? Use the available figures to see if you can identify any pattern to which areas send relatively large remittance payments, and which send much smaller average payments. 4. Where do all the remittance payments go? Level One: Use the information from Table VI.A.2 to draw a map with arrows showing the largest single flows from each area in the USA to their corresponding state in Mexico. Level Two: Work out the dollar value of the main remittance flows, by using the % figures given for some areas in Table VI.A.2 and their corresponding total annual remittance values from Table VI.A.1. (eg the value of the Los Angeles to Jalisco flow is 26% of $7,886.3 million). Then map the ten largest flows using flowlines (arrows where the width of each arrow is proportional to the value of remittances). Look at the map or maps created and see if you can identify any patterns. If you can describe a pattern, then also look to see if you can find any anomalies, and try to explain your findings. Home Town Associations (HTAs) are associations created by migrants to promote links between their hometown communities of origin (Mexico) and their communities of residence in the USA. Many HTAs raise money (via dances, raffles, beauty pageants and other events) to fund public works and social projects in Mexico. Mexico offers important additional funding to multiply the impact of “collective remittances” sent home from HTAs. Every dollar sent home is matched by three dollars, one from each level of Mexico’s political administration: federal, state and municipal. This means that a relatively small input of dollars from an HTA can be the catalyst to fund a school or new road. Atacheo de Regalado has a population of fewer than 2000 inhabitants, and is only 15 km. northeast of the large commercial city of Zamora, in the state of Michoacán. Atacheo de Regalado has implemented five productive community projects under the “3 dollars for 1” scheme, based on remittances sent home from migrants in the USA, mainly in Illinois. The projects, involving 336 families, have been organized by the priests of a local church, and include a turkey farm, a goat farm, hydroponics green houses to grow vegetables and flowers for export, a factory for loudspeakers and baffles, and a bull-fighting ring. These five projects represent a total investment of about $1.5 million (dollars). The community exported 220 tons of tomatoes to the USA in 2003. 1. A rastro (meat factory) to process up to 2000 turkeys a day for sale to supermarket chains. 2. A pasteurization plant for goat milk, to process up to 40,000 liters daily for export to the USA.